Research points to the growing use of digital devices. 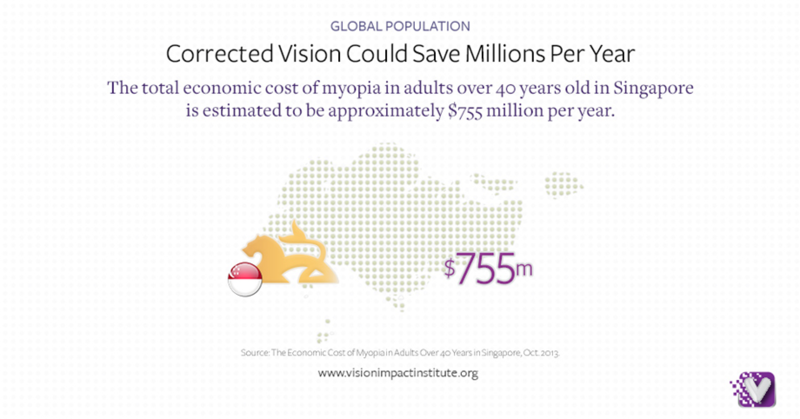 In parallel, myopia is at epidemic levels in countries around the globe. Taking the longer view, this epidemic could have a negative impact on the lives of the myopic people, especially as they age, and will increase the economic burden that poor vision creates on the world around us. That astonishing statistic speaks to the power and pervasiveness of digital communication and information. Millions of people on this earth can use the technology to text or make a phone call, yet may not have running water and electricity in their residences. Let’s admit that there is a hypnotic quality to the digital screens that inhabit our lives. Follow someone into an elevator as they are absorbed in what they’re reading on the phone. Stop to watch people on a busy street corner, exiting an office building or on public transportation – it’s a safe bet that a large number will have a smartphone or other digital device in their hands. We are turning more and more of our daily routine over to our digital devices. From getting the news, to paying for coffee, to receiving directions to reminding us of appointments – digital devices have become the personal assistants for 21st-century lives. We are living multi-screen lives and are more productive because of it. However, have we stopped to consider how spending so much time squinting at small screens is impacting our vision? Eye health professionals are increasingly worried about “digital vision” and the consequences resulting from spending so much time focused on small screens. In addition to failing eye sight, there are the related health issues and socio-economic impacts to consider. While users aren’t abandoning their digital screens, eye health professionals should be aware how to better advise them to be productive and retain their healthy vision. In parallel, we observe a rise of myopia in developed and developing nations worldwide. It’s at epidemic levels. Eastern Asia, Europe and the United States have all seen a dramatic increase in the number of people who are experiencing shortsightedness. Myopia is an elongation of the eyeball. While not being able to see distances can be frustrating, even dangerous when driving, it can be corrected with spectacles, contact lenses and refractive surgery. However, high myopia has been associated with a higher risk for ocular disorders, including retinal detachment and glaucoma. The E3 study also shows that younger people are more affected by myopia than their parents. According to the study, about one-half of younger Europeans are affected. After analyzing the data, the study uncovered that overall levels of myopia have increased about one-third for adults born after 1940 as compared to those born before that year. Another interesting finding in several research studies is the association between level of education and the incidence of myopia. The research suggests that the more educated the person – regardless of where they live – the more likely they are to suffer from shortsightedness. This is significant because it points to lifestyle factors as having a role in the rise of myopia. 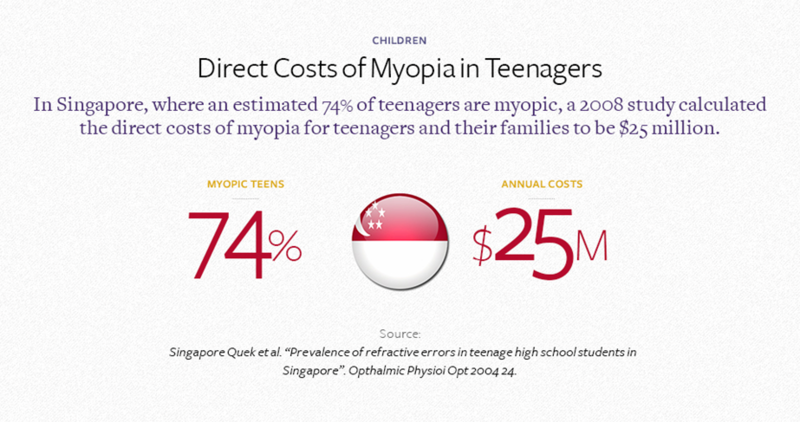 This rapid rise in myopia is alarming, especially as it affects younger people the most. 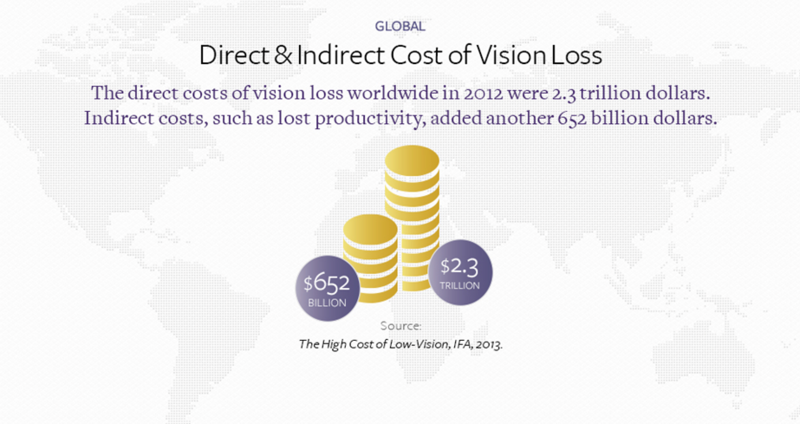 Are we raising a global generation that will suffer from poor vision throughout their lives? There is research that indicates that sunshine can be an antidote to digital vision. An Australian research project from 2003-2005 shows that time spent outdoors in natural light significantly affected the presence of myopia in children. Longer time of outdoor activity, such as sports and leisure activities, were associated with more hyperopic refractions and lower myopia rates in the 12-year-old students studied. Those who combined longer time of near work with shorter time of outdoor activity had the least hyperopic mean refraction, while the students who combined low levels of near work with high levels of outdoor activity had the most hyperopic mean refraction. The lowest odds for myopia were found in groups reporting the highest levels of outdoor activity. Chinese schools are testing various methods to improve that country’s myopia epidemic. Some schools are experimenting with transparent classrooms – the walls and ceilings are constructed of see-through material to allow for as much light as possible – to determine if that helps improve the students’ eyesight. The role of sunlight in our eye health is not completely understood as of yet. A theory suggests that the healthy wavelengths on the blue light spectrum from the sun (the good blue) releases dopamine in the retina which would prevent the eyeball from elongating, thus preventing from myopia. These wavelengths are also protective to vision and other health functions. And the cumulative effect of the damaging wavelengths of blue-violet light (the bad blue) has been linked to retinal cell death, and possibly to AMD. The sources such as artificial light (cold LED), computer screens and hand held devices are rich in harmful blue-violet light and may source potential risks. With the increased use of digital devices and rising rates of myopia, an annual exam is the best way for parents to have poor vision diagnosed – and then corrected as needed – in their children. In addition to good old-fashioned outdoor playtime for children, the importance of an annual eye examination by a trained vision professional can’t be over-emphasized. With the increased use of digital devices and rising rates of myopia, an annual exam is the best way for parents to have poor vision diagnosed – and then corrected as needed – in their children. To strengthen research on myopia, Essilor International and the Wenzhou Medical University in China, opened in 2013 a joint research laboratory: the Wenzhou Medical University-Essilor International Research Center (WEIRC). “What makes it all the more important is that the link between the severity of myopia and the risk of associated conditions is exponential. Slowing the development of myopia by only 50% reduces the risk of conditions that can lead to blindness (retinopathy, retinal detachment, etc.) by a factor of 10,” explains Dr. Björn Drobe, Essilor Group Researcher and Associate Director of WEIRC. The laboratory works on three different approaches. The first is to gain a clearer understanding of the mechanisms that cause children to develop myopia. The second focus for research relates to the predictability of myopia, and more particularly involves a study conducted with a group of 1,000 children from urban and rural environments. Lastly, the laboratory is working to identify new ways of controlling the development of myopia through a clinical trial involving 210 children. “Ultimately, the new knowledge gained will enable us to make our products more effective in terms of slowing the development of myopia with offerings that are suitable for all children and are attractively designed, as well as enabling the development of innovative solutions to counter the myopia pandemic,” summarizes Dr. Björn Drobe. 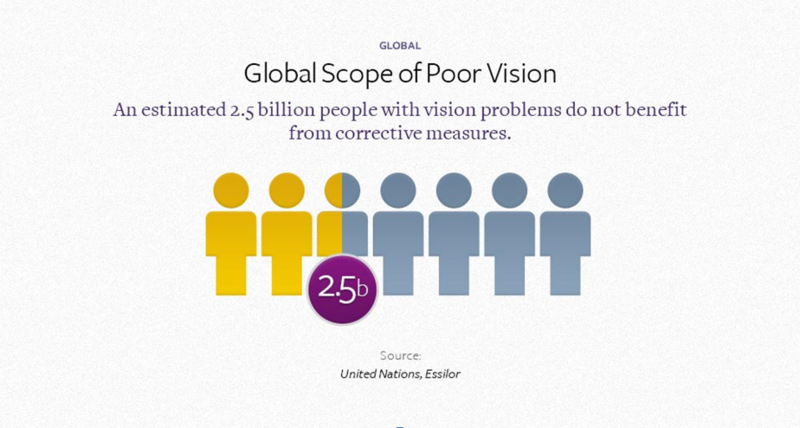 Impaired vision is the most common disability in the world, affecting 4.3 billion around the globe. The good news is that 80 percent of those impairments can be avoided or cured. However, that much vision impairment comes with a price tag. 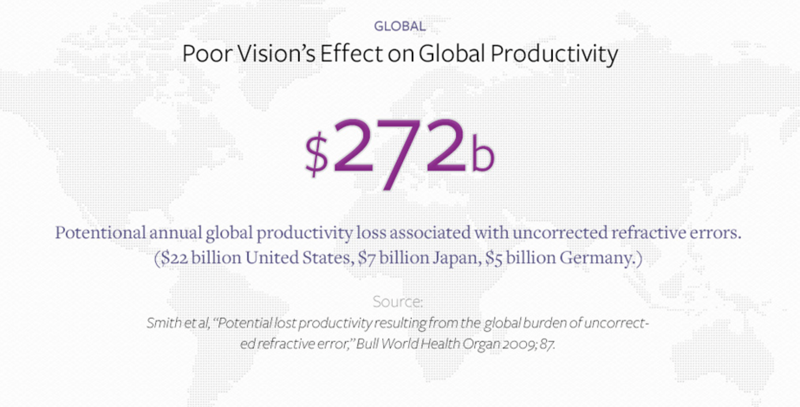 Approximately 33 percent of the world’s working population has uncorrected vision problems that result in a $272 billion loss of productivity to businesses globally. Poor vision slows the education of school-aged children, resulting in academic under-achievement and risk of reduced adult literacy. In fact, 30% of children worldwide need vision correction and don’t have it. Impaired vision is associated with 60 percent of driving accidents around the world. Globally, poor eyesight multiplies by seven the risk of falls and hip fractures in the elderly. Research has indicated that myopia is rapidly rising in East Asia, Europe and the United States, especially among younger people. And research points to factors other than genetics, such as behavior and environment, as causing this epidemic. Is the common denominator among these the time spent using digital devices at near? The global use of these devices is only going to grow as we increasingly rely on them to connect with friends, get our news, make financial transactions, and simply make our lives easier and more productive. As a planet, we spend 3 billion hours a week playing video games. That means that we will spend more time in “digital vision” mode - fixated on small glowing screens using our eyes for near vision more often. Yes, the majority of myopia cases can be corrected with spectacles, contact lenses or refractive surgery. And the research centers such as Vision CRC and WEIRC, as well as the technology development, give us hope for a better-seeing future. However, with so many young people dealing with shortsightedness, as they age the cost and impact of poor vision is likely to increase from such things as loss of productivity, [21, 22] motor vehicle accidents, falls, and social isolation. Add to that the significant increased risk people with high myopia have for related vision diseases. Let’s not give up the digital devices, but let’s be sure to take care of users’ eye health while advising both an annual comprehensive eye examination and frequent breaks from “digital vision” to take in a longer view. • An epidemic of myopia is circling the globe, with Eastern Asia, Europe and the United States seeing rising rates of shortsightedness, especially in young people. • Research shows that there is a link between education level and myopia rates – those with more education are more likely to be myopic. • Corresponding to the increase of myopia is also an increase in near vision demanding tasks including the use of small digital devices as people rely on them more not only to communicate, but also to access news, information and entertainment. • “Digital vision” will likely have a socio-economic impact on the world, especially as young people with myopia grow older. 03.Jung SK, Lee JH, Kakizaki H, Jee D., Prevalence of myopia and its association with body stature and educational level in 19-year-old male conscripts in seoul, South Korea. Invest Ophthalmol Vis Sci. 2012 Aug 15;53(9):5579-83. 04.Lee YY, Lo CT, Sheu SJ, Lin JL. What factors are associated with myopia in young adults? A survey study in Taiwan military conscripts. Invest Ophthalmol Vis Sci 2013;54:1026Y33. 05.Xiang F, He M, Zeng Y, Mai J, Rose KA, Morgan IG. Increases in the prevalence of reduced visual acuity and myopia in Chinese children in Guangzhouover the past 20 years. Eye (Lond). 2013 Dec;27(12):1353-8. 06.Koh V, Yang A, Saw SM, Chan YH, Lin ST, Tan MM, Tey F, Nah G, Ikram MK. Differences in prevalence of refractive errors in young Asian males in Singapore between 1996-1997 and 2009-2010. Ophthalmic Epidemiol. 2014 Aug;21(4):247-55. 07.Williams KM, Verhoeven VJ, Cumberland P, et al. Prevalence of refractive error in Europe: the European Eye Epidemiology (E3) Consortium. Eur J Epidemiol. 2015 Apr;30(4):305-15. 08.Vitale S, Sperduto RD, Ferris FL 3rd. Increased prevalence of myopia in the United States between 1971-1972 and 1999-2004. Arch Ophthalmol. 2009 Dec;127(12):1632-9. 09.Williams KM, Bertelsen G, Cumberland P, et al. Increasing Prevalence of Myopia in Europe and the Impact of Education. Ophthalmology. 2015 Jul;122(7):1489-97. 10.Bao J, Drobe B, Wang Y, et al. Influence of Near Tasks on Posture in Myopic Chinese Schoolchildren. Optom Vis Sci. 2015 Jun 26. [Epub ahead of print].